Some of us like to travel by ourselves, alone without depending on anyone to give us company. Sometimes these solo journeys give a new meaning to our life. When you travel alone you are free to go to any extreme and discover places without waiting for anyone. Some of these places are not known to many until they come across a person who has taken the route to explore the unexplored. India is a land of many mysteries and charm; every corner of the country has at least one or two unexplored destinations. Most of the popular tourist destinations continue to get numerous tourists. In India, there are countless destinations which aren't very popular and kept hidden away from the hawk-eyed tourists. These hidden destinations are as precious as hidden gems. They will give you an experience of your lifetime which will help you to rejuvenate and surrender yourself to nature's ever open hands. Here we bring you 15 such hidden gems which would help you rejuvenate and also help you to get a new definition of life. Odisha is known for its summers being pretty hot, with the temperatures crossing 50 degrees. Amidst this boiling pot is Daringbadi which receives snowfalls in winter. The place is a small hill station which is surrounded by thick rainforests and wild animals. A hill station which is aptly called the Kashmir of Odisha, as the temperature here drops to 0 degrees in winter. It is blessed with immense natural beauty and diverse flora and fauna. Orchha in Madhya Pradesh is slowly emerging to be a hub of tourists. It is known for its fantastic architecture which dates back to the 15th century. The population in this town is estimated to be less than 10,000. Also Read : Orchha - A Royal Creation! It is a perfect place for one to just walk through the monuments and spend enough time to observe their beauty without any interference. One can also opt to go for river rafting in the Betwa river to satisfy the adventure junkie in oneself. The small village of Tinchuley has escaped from the rush of its neighbours, Siliguri and Darjeeling. An ideal destination for a quiet stroll through the forest pathways and perfect just to tune yourself out from the rest of the world. Also Read : 10 Attractions Of West-Bengal! The village gets its name from the three main peaks which surround it and it resembles three chimneys. There are viewpoints set up on these peaks from where one can see Darjeeling, Gangtok, Kalimpong and Mount Kanchenjungha. Often described as the hippie capital of west India, Pushkar is a place which needs to be seen to be believed. This city lies on the banks of the Pushkar lake. It is a religious place and is one of the five sacred places of worship (dhams) for hindus. The place has a considerable amount of self-proclaimed godmen and ascetics along the various ghats here. Pushkar is also the only place in the world which has a Brahma Temple. The town has 52 bathing ghats and 400 temples. You would have heard about or visited the Tibetan settlements in Himachal Pradesh and Karnataka. Mainpat is another one of these Tibetan settlements in Chhattisgarh. In the 1960s a group of Tibetan refugees who were road construction workers at Sitapur settled in Mainpat. The Thakpo Shedupling Monastery is the main attraction here along with the food and warm hospitality of the Tibetans. This beautiful valley in Arunachal Pradesh is a hub of economic activities as well as counter-culture. The place is famous for its brilliant annual music festival known as the Ziro Valley Carnival. The area is famous for its paddy fields where there is a unique system of polyculture and water management which is practised here by the locals. The place is home to the Apatani Tribe. Arambol, also known as Harmal in the northern part of Goa is considered as the ideal beach for the many long-staying and tight-budgeted travellers. Hippie foreigners, mainly Russians who come to this place end up staying here for years at a stretch. It was first found in the 1960s as a getaway from the other over crowded beaches in town. At present also things haven't changed with budget accommodation in the little huts which cling to the cliffsides. It has an uninterrupted chain of shacks which are cheap and affordable. The Nubra Valley is one of the most peaceful and stunning places. The valley is formed by the conjoining of two rivers which are Siachen and Shayok. The sights keep becoming more beautiful as the altitude increases. The valley is located at an altitude of 10,000 ft above sea level. A point to be noted is that until 2014 Indian citizens required a permit to visit this place. Dzukou means cold water in the local language of Angami, one of the languages of the 16 main Naga tribes. It is one of the most recommended treks to be taken in Nagaland, but information available is very slim and incomplete. It is a hidden gem in the vast Nagaland, always welcoming its travellers. The valley is also famous for its stunning and beautiful varieties of flowers, which gives it another name as the Valley of Flowers. It is a little-known hamlet in the Tirthan Valley and can be easily approached from the Chandigarh-Manali highway in a private transport. It is a place which transports you to a dreamland and would take you some time to realise that this place is truly beautiful. The small wooden huts, with a river cutting across the rocks, is an ideal place to make your dreams come to life. Majuli is a highly environmental friendly island. It is a lush green, pristine and pollution-free fresh water island in the river Brahmaputra. Spread across an area of 250 sq km, it has found its way to being listed in UNESCO's World Heritage Sites. Initially, the island was spread across an area of 1250 sq km, but thanks to the major soil erosion happening around here, this island is reducing in size. At a height of 17,100 ft, Gurudongmar Lake is one of the highest lakes in the world. The lake is named after Guru Rinpoche, the founder of Tibetan Buddhism after he visited the lake in the 8th century AD. It is also believed that Guru Nanak stopped here to quench his thirst and with his stick, he cracked open the ice which lead to the formation of the lake. Even today during the roughest winter, there are parts of the lake which remain unfrozen. It is a village in Himachal Pradesh, at the end of the Parvati valley. It leads to the Pin Parvati Pass and is very beautiful. Tosh is an alternative of Kasol. Imagine Kasol in Himachal Pradesh without its modernity, then you have Tosh. It still is a village with the slate roof houses. It is slowly gaining its popularity amongst the hippy crowd for the good stuff. A wooden bridge is the only connection it has from the rest of the world, but as you cut across the bridge you will tend to slip into a bygone era. Radhanagar Beach is also known as Beach No.7 in Havelock which is quite unique. In 2004, TIME magazine had voted it as the ' Best Beach in Asia'. The way the beach is maintained gives you the feel of sitting at an isolated or private beach. The beach also has not seen much commercialization as much as its counterparts. Dharchula is a scenic town which lies on the way to Mansarovar lake in Uttarakhand. It is also a border town between India and Nepal and people from both the sides pass through it without any restrictions. It is home to the Rung tribe which has a place in history as well. The town is completely surrounded by hills on all sides and gives you breathtaking views. 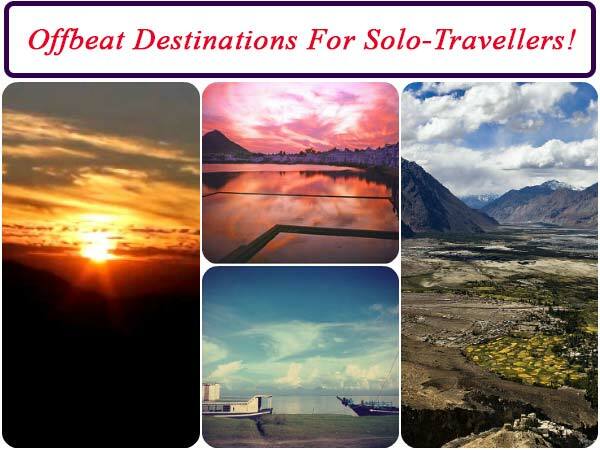 The main attractions of this place are the Chikrila Dam, Om Parvat, Kali River, Manosarovar Lake and the Narayan Ashram.